Peter has worked with cars since the mid-2000s. He began his career as a qualified engineer specialising in Volkswagen parts. Realising that his passion was in car repair, Peter retrained as a technician. 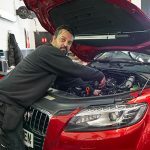 He now has several years’ experience building building his knowledge base and skills to become the experienced technician and valued team-member that he is today. Peter lives in Hertfordshire with his wife and dog. When he’s not under a vehicle, or otherwise indulging his passion for cars, motorbikes and motorsports, he enjoys hiking as well as anything to do with nature and animals.